On behalf of Mashable, I recently wrote an article published on American Express OPEN Forum, a web community for business owners. 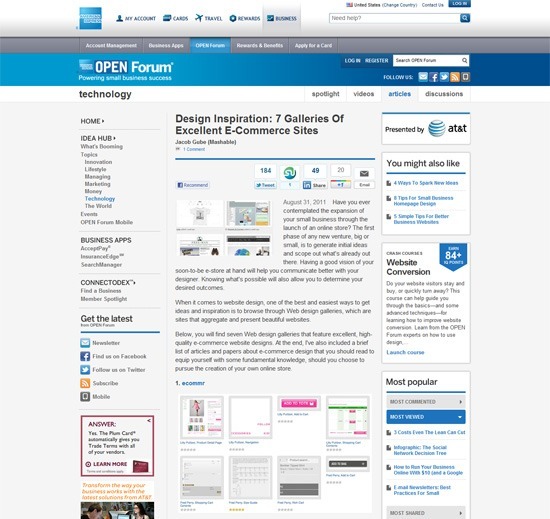 The article is a roundup of web design galleries focused on e-commerce website design. Have you ever contemplated the expansion of your small business through the launch of an online store? The first phase of any new venture, big or small, is to generate initial ideas and scope out what’s already out there. Having a good vision of your soon-to-be e-store at hand will help you communicate better with your designer. Knowing what’s possible will also allow you to determine your desired outcomes. Just in case you were wondering: I’m a contributing author on Mashable, helping them cover development- and design-related subjects on their Dev & Design channel.